Since March 8th was International Women’s Day, I am writing a series on Great Swedish Women, past and present: women with strength and passion, women who create change. For seven days, I am writing about these women, one per day. I hope you want to join me in celebrating them. Part 5 – the vengeful Viking Blenda. In the county of Småland in Southern Sweden, there is a legend about a brave Viking woman named Blenda. According to legend, the menfolk of Småland were at war in Norway, leaving the women and children alone and defenceless. The Danes learned of this and chose this moment to invade and attacked the region. Blenda was a woman of noble descent and she decided to rally all the womenfolk in the hundreds of Konga, Albo, Kinnevald, Norrvidinge and Uppvidinge. The women armies assembled on the Brávellir, which according to Smålandish tradition is located in Värend. The women approached the Danes and told them how much they were impressed with Danish men. They invited the men to a banquet where they were provided with food and drink. After a long evening, the Danish warriors fell asleep and the women killed every single one of them with axes and staffs. When the king returned, he bestowed new rights on the women. They acquired equal inheritance with their brothers and husbands, the right always to wear a belt around their waists as a sign of eternal vigilance and the right to beat the drum at weddings amd wear armour. There have been various disputes about the validity of this legend, if and when it happened. One theory is that it happened around the year 500. At this time, female soldiers existed in Sweden. Called Shieldmaidens, three hundred are known to have fought during the great Battle of Bråvalla in 750. 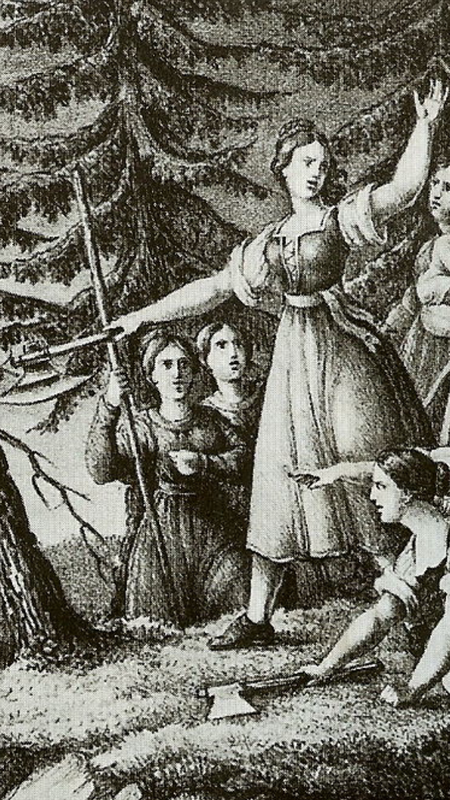 Blenda is perhaps the first known woman in a long line of strong Swedish women who defend themselves from aggressors and contribute to better equal rights between the sexes.